Cyber is fast becoming a buzzword that seems to be the start of every anecdote, business horror story or sales pitch these days. Yet rarely do you find someone who can truly articulate what he or she mean, or offer a concise explanation. Why? Well, perhaps that is because Cyber seems to be a catch all title for a myriad of issues. When someone talks about Cyber what are they talking about? Data and Privacy, System Dependency and Denial of Access Attacks, Computer Controlled Manufacture or Stock Ordering Automation, Connected Devices, Social Engineering Scams, Electronic Payment Systems, Credit Card / Payment Details, Impersonation Fraud or a mysterious email from a Nigerian Prince looking for a partner to help him extricate millions of dollars in gold? Investments in IT systems reached an all-time high in 2018 with worldwide spending forecast to exceed $4.7 trillion in 2018. This highlights that we are increasingly becoming technology dependent both in our personal lives and in business. The average British household now owns 7.4 internet devices, with four out of 10 households buying a tablet in the last year. Smartphones are the most common internet-enabled device, at 1.7 per household, according to a YouGov poll of more than 2,000 consumers. Globally more people now access the internet by mobile device than desktop. As highlighted by some major high-street failures in the last 12 months, businesses need to respond to changing demand. According to the Office for National Statistics, spending online continued to increase to reach a new record proportion of all retailing at 18.2% in July 2018. It is an unavoidable fact that restricting trading to shop-opening hours is increasingly becoming outdated and businesses are investing to cater for this need. A significant proportion of the increased investment in recent years has been dedicated to improving IT security as a result of the increasingly frequent and highly publicised instances of cyber-attacks and data breaches. However, the expenditure on training and awareness is not keeping pace, so the biggest risk to any business is not the technology but more likely the users. Undeniably the risk of businesses suffering a loss as a result of a cyber-attack, virus or data breach is increasing to the extent that this cannot be ignored. Global Insurer AIG forecasts that the worldwide market for Cyber Insurance will grow at 20% year-on-year until 2023. Despite this less than 25% of UK businesses are thought to have Cyber Insurance. Given that “Cyber” could refer to any system dependency or any form of Data it is crazy to think that a business would insure against the risk of losing hardware but ignore the data contained on it. Stackhouse Poland are a market leading specialist commercial broker and renowned Cyber Specialist focused on supporting SME’s and Mid-Market UK businesses. It is precisely this area of industry that is most at risk and yet is rarely catered for. In 2018 Stackhouse Poland were crowned Best Commercial Broker for SME/Mid Corporate at the British Insurance Awards 2018 and praised for our unique and innovative approach to Cyber Insurance. We have also been shortlisted for Best Cyber Broker at the UK Broker Awards and we have several members of our National Cyber Practice Group feature in the Insider Cyber Rankings including Chair of our Practice Group, Chris Lennon, shortlisted as Most Skilled Cyber Broker. 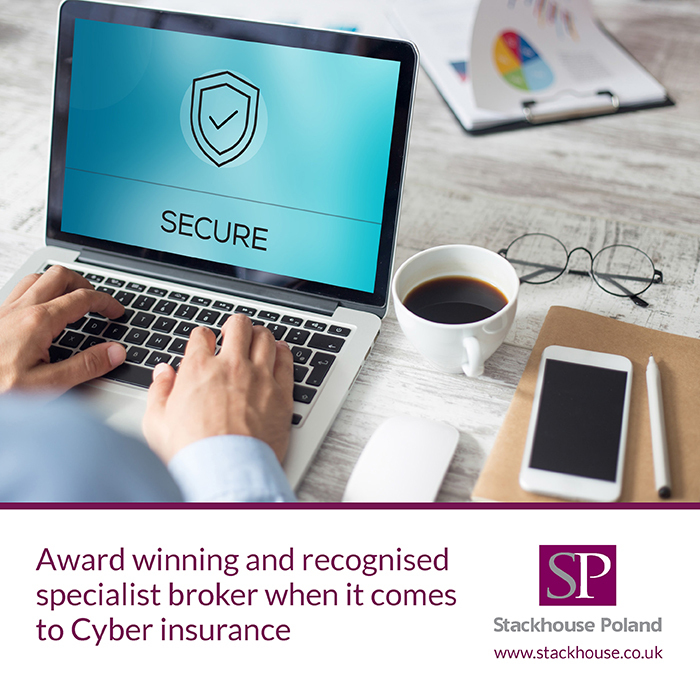 If you would like more information or to speak to an expert for a free and impartial chat as to how you can mitigate and transfer your cyber risks please speak to a member of the Stackhouse Poland Team. Please call us on 0330 660 0401 or email commercial@stackhouse.co.uk or visit www.stackhouse.co.uk to find out more.